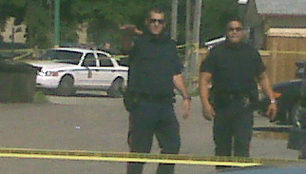 While many Winnipeggers relax at the lake on a blazingly hot weekend, our city police force has been doing anything but. Three confirmed stabbings – one of them very nearly a homicide. Two confirmed shootings – one of them most certainly to be a homicide; the other involving a doofus walking around the inner-city pointing a gun at people at 9:30 a.m. in the morning then shooting at the cops trying to catch him. The other, also in broad daylight, sounds almost like an execution in front of a busy stretch of Main Street. Each of these incidents involved a massive amount of police manpower to investigate. At the first shooting, as many as 20 squad cars (about 40 officers) were at the scene at one point. Kudos to the officers in the duty office who were kind enough to break protocol and inform the public about what was happening and what was being done about it. The regular PIO is closed for the second weekend in a row.